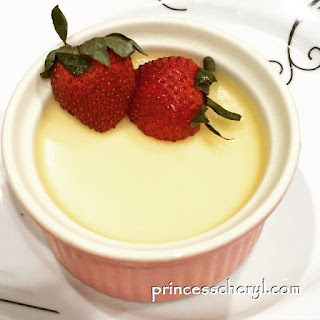 Panna cotta (Italian 'cooked cream') is an Italian dessert of sweetened cream thickened with gelatin and molded. The cream may be aromatized with rum, coffee, vanilla, or other flavorings. 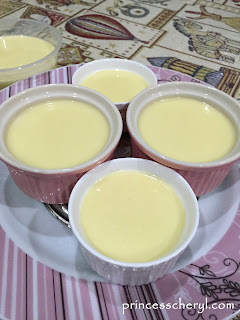 Lately I found that many of the breastfeeding mothers are crazy over panna cotta as many found it a great milk booster. So I decided to try out before I resume my breastfeeding journey real soon (probably in another 2 weeks' time). My little bump always craves for desserts, so this is a good chance to satisfy her sweet tooth as well. I made some minor changes from the recipe I found online, and this is it. In a saucepan, stir together the heavy cream and sugar, and set over medium heat. Bring to a full boil, watching carefully, as the cream will quickly rise to the top of the pan. Pour the gelatin and milk into the cream, stirring until completely dissolved. Cook for one minute, stirring constantly. Remove from heat, stir in the vanilla and pour into six individual ramekin dishes. I appreciate the way you make the food richer and more creamy. It will be more yummy and the taste will be improved a lot. Is there any difference in buttermilk and condensed or purely milk? I read from some recipe that suggested buttermilk so I tried it. Buttermilk tastes sour compared to milk.